Our maintenance free vinyl octagon gazebos are available in sizes: 8’x8′,10’x10′, 12’x12, 14’x14′, 16’x16′,18’x18′ and 20’x20′. Our vinyl gazebos have 40-year tested, pressure treated southern yellow pine construction with a high quality vinyl sleeve (that means no wood is exposed to the outside elements). We use only vinyl with the highest grade materials and added thickness for extended service life and attractive appearance. Available colors are white or ivory. The 5/4 floor decking is a wood plastic composite. Roof options are cedar shingles, asphalt shingles or slate look composite roofing. Available with a screen kit or with a 4-track window system. The kits are sold in pre-assembled form but the 8’x8′, 10’x10′ and 12’x12′ sizes can be sold assembled or we can have a crew assemble on site. Popular options are screens or 4-track windows with screens. The 4-track comes with tinted or clear film, they are easy to use and take care of. 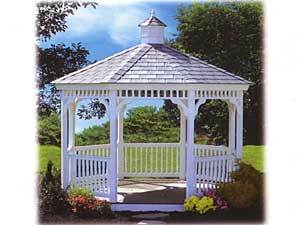 The gazebo also comes with a screened in floor. Add electric for lights or a ceiling fan. A great accessory is a gas fire pit to add some warmth in the spring, late summer, and early fall.